What's the difference between weather and climate ? Climate where you live on the globe is called regional climate. It is the average weather pattern in a place over long periods of time. The regional climate also informs over the seasonal variations. The regional climate encompasses the temperatures, humidity, rainfall, atmospheric particle count and numerous other meteorological factors in a given region. The climate in your place is affected by its latitude, terrain, altitude, persistent ice or snow cover, as well as nearby oceans and their currents. Climates can be classified using parameters such as temperature and rainfall to define specific climate types. 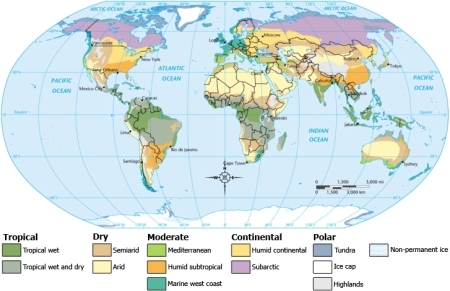 The climate zones of the world. Source: www.wikimedia.org. However, we can also look at climate at the scale of an entire planet. Global climate is a description of the climate of the planet as a whole, with all the regional variations averaged over long timescales. Overall, global climate depends on the amount of energy received by the Sun and the amount of energy that is re-emitted by the Earth into space. We observe changes of the climate if these energies are not in balance. The weather can change in just a few hours. Strong climate events, like El Niño, can however last for several years. Small scale climate fluctuations last for decades and larger climate changes happen over hundreds and thousands of years. Today, climates are changing. Our Earth is warming more quickly than it has in the past according to the research of scientists. Global warming is causing the global average temperature of the Earth's atmosphere to increase. The difference between weather and climate is a measure of time. Weather is what conditions of the atmosphere are over a short period of time while climate is how the atmosphere "behaves" over relatively long periods of time. Common weather phenomena include wind, cloud, rain, snow, fog and dust storms. Less frequent events include natural disasters such as tornadoes, hurricanes and ice storms. Weather phenomena happen because of temperature and moisture differences between one place to another. These differences can occur due to the sun angle at any particular spot, which varies by latitude from the tropics. Because the Earth's axis is tilted relative to its orbital plane, sunlight is incident at different angles at different times of the year. As a consequence we observe seasonal variabilities of our weather. Surface temperature differences in turn cause pressure differences. A hot surface heats the air above it and the air expands, lowering the air pressure and its density. 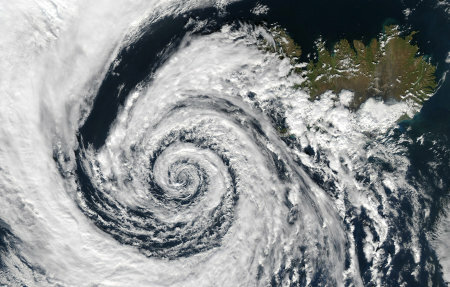 The resulting horizontal pressure gradient accelerates the air from high to low pressure, creating wind, and Earth's rotation then causes curvature of the flow via the Coriolis effect: on the northern hemisphere to the right, on the southern hemisphere to the left, when looking into the direction the wind blows. 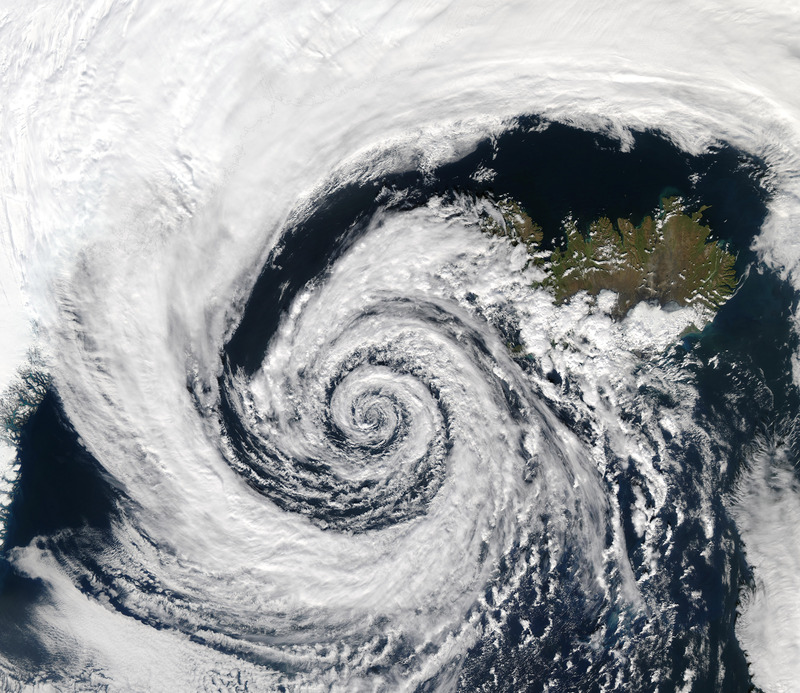 This low pressure system over Iceland spins counter-clockwise due to balance between the Coriolis force and the pressure gradient force. Visit the tutorial on ocean currents for more informations. Image taken by Aqua/MODIS on 04/09/03. Source: Jacques Descloitres, MODIS Rapid Response Team, NASA/GSFC. Weather forecasting is the application of science and technology to predict the state of the atmosphere for a future time and a given location. Weather forecasts are made by collecting quantitative data (i.e. satellite data) about the current state of the atmosphere and using scientific understanding of atmospheric processes to project how the atmosphere will evolve.